So, how did your “trip” to Rome go? Did you find any books (or movies) that transported you to the Eternal City? How did you like this first month of the Challenge? As I said in a previous post, I watched Roman Holiday which had lots of scenes of Rome and lots of Roman atmosphere. However, I didn’t find a book to read so I’d be interested to hear what you read and whether you’d recommend it. If you are a fan of Ancient Roman history, I’m sure you had no trouble finding lots to choose from. There seems to be an abundance of historical fiction set in Rome – lots of gladiators and togas. However, contemporary Rome was harder to track down – did anyone read a book set in Rome in the present day? Don’t unpack your passport (um, library card) just yet – tomorrow we head back to the US and the great Pacific Northwest. OK, maybe not that funny but I couldn’t resist. It’s time for a halfway check of the first month of the 2017 Online Reading Challenge – how are you doing with this month’s reading? 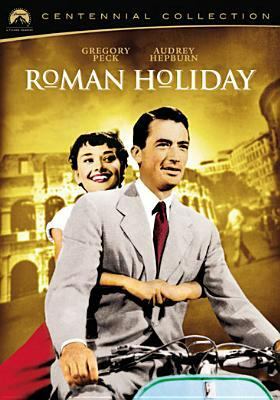 I picked a classic, where the city of Rome is as much of a star as the actors – Roman Holiday starring a luminescent Audrey Hepburn and ruggedly handsome Gregory Peck (and co-starring Eddie Albert, who I only remember from watching reruns of Green Acres!) Directed by William Wyler and with costumes by Edith Head, the movie is a call back to the golden age of Hollywood. It’s also the movie that made Hepburn a star and earned her an Academy Award at the age of 24. Filmed entirely in Rome in 1953, the movie follows a young Princess Ann (Hepburn) who slips away from her gilded cage to have some fun before her royal duties completely take over her life. She meets up with American journalist Joe Bradley (Peck) who, realizing who she is, offers to show her around the city. He is, of course, hoping for an exclusive story but instead finds himself falling in love. Set against some of the most beautiful landmarks of Rome – the Spanish Steps, the Trevi Fountain and the Colosseum (both inside and out) – the couple (trailed by Joe’s friend Irving (Albert) who is taking pictures of the princess on the sly) enjoy an idyllic day including coffee at a sidewalk cafe, a wild Vespa ride through the twisting streets of the city and a dance party on a barge on the Tiber River. It has all the elements of a romantic comedy, set in one of the most romantic cities in the world. Although I was surprised by the ending, I enjoyed this movie a lot. Despite the picture on the DVD case, the movie is in black and white and you really do feel like you’re stepping back in time. The stunts and lack of fancy CGI might have made it seem awkward and forced, but instead its charm and heart make it a joy to watch. So tell me – what have you been reading (listening to, watching) this month? Hello and Welcome to the first month of the 2017 Online Reading Challenge! This year we’re going to travel the world, “visiting” a new country or city each month, giving us a chance to experience a little of other cultures without the annoying airport security lines! Grab your passport (library card) and let’s take off! Our first stop is Rome, a city that wears it’s ancient history proudly. Once the center of the known world, it remains a favorite for travelers and adventurers alike. There is no shortage of books set in or about ancient Rome. Mystery lovers should take a look at the popular murder mysteries by Lindsey Davis or John Maddox Roberts. 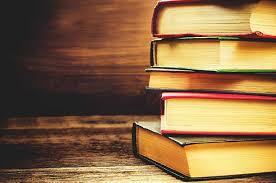 For fiction, try any of several titles by Colleen McCullough or Robert Harris. 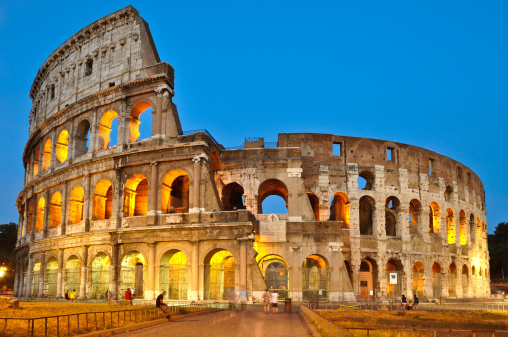 If you’re looking for a travel guide, go to 914.563 where you’ll find information on Rome and Italy. For Roman history (and there’s lots of it!) look in 937. There are lots of DVDs to try too – the HBO series Rome (caution: mature themes!) is spectacular or look for Gladiator or Ben Hur. I, Claudius, an older PBS series has minimal production values (in sharp contrast to modern films) but the acting and story lines are amazing and you’ll be hooked immediately. For more contemporary setting, try Stuart Woods Foreign Affairs or The Imperfectionists by Tom Rachman. You might also check out the movie When in Rome, a romantic comedy. And there’s always Dan Brown’s Da Vinci Code (and yes, I know it’s mostly set in the Vatican but I’m still counting it). Remember, there are no Library Police! If you would prefer to read something set in Italy, or only a bit in Rome, go for it; it still counts! As for me, I’m going to start by watching Roman Holiday with Audrey Hepburn and Gregory Peck. I’ve never seen this movie and figure it’s high time I fixed that. I’m also going to see about reading a book set in Rome – I’ll let you know how that goes. Now, what about you? What are you going to read (or watch or listen to) this month? Like all boys growing up in Rome during the 1930’s and 40’s, the author was expected to join Balilla, Mussolini’s Fascist Youth Organization in Italy. An unwilling participant, he counters this activity by becoming a bicycle runner, secretly delivering pamphlets and other materials to members of the Resistance. Later, near the end of the war, after Italy has surrendered to the Allies but is still controlled by a puppet German government, Romagnoli flees Rome to avoid military conscription. Hiding in the remote mountainous countryside, he becomes even more dangerously involved in the Resistance, working with both American and British soldiers. 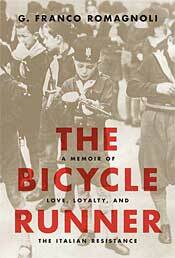 But The Bicycle Runner, which covers his life from ages 14-25, is much more than a war story. In fact, it reads much more like a coming-of-age novel, full of the usual adolescent angst weaved together with plenty of humorous anecdotes. Examples include his descriptions of fearful confessions to the local priest (which the entire congregation can hear) to his first experiences with love and lust. The author may be better known for co-hosting the first American television program on Italian cooking, The Romagnoli’s Table, for which he coauthored two companion books. Though he passed away in December of 2008, the love for his native land and culture comes through strikingly clear; the subtitle, A Memoir of Love, Loyalty and the Italian Resistance, is perfectly appropriate. 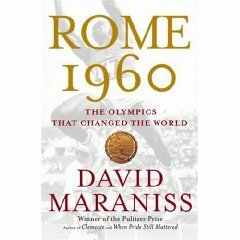 Setting the personal stories of the 1960 Olympics in the context of world events and issues, Rome 1960 by David Maraniss adds credence to the thought that the Olympics are a reflection of their time. 1960 saw, among other things, some of the first instances of illegal performance enhancing drugs, political unrest in the decision to make China enter the games under the name of Taiwan and tensions spilling over from the Cold War, the spotlight shining on the social injustices still felt by black Americans even as they became heroes to the rest of the world, and the practice of strict amateruism coming under scrutiny. This was also the Olympics of Cassius Clay (soon to become Muhammad Ali), Wilma Rudolph (who overcame childhood polio to win gold) and Ethiopian marathoner Abebe Bikila who won gold while running barefoot. The Opening Ceremonies of the Beijing Olympics will be held tonight; what insights into the state of our world will we see from China?